Aadhaar update. Find Aadhaar Card Correction Status Online. Know how to update Name, DOB, Address, Mobile number, A to Z guide. If you want to check the aadhar card update status follow our tutorial below. Update mobile number in case of loss retrieve forgotten uid number and enrollment id. Which details can correct with SSUP( Self Service Update Portal)? You can Update Aadhaar Card Status online of these below things at uid self-update service portal (SSUP). To check your correction status you can use this URL https://ssup.uidai.gov.in/check-status. update/correct and send the documents to uidai office or email THEM OR attach color scanned. check update status by Update Request Number (URN) FOR FUTURE. There two ways to update /change your data like Name correction, Address change, Mobile number Update and mostly 70% Date of birth Mistakes. All Corrections need Documents proofs given By State and Central Government. Date of birth Change you have to upload Date of birth Certificate, Pan card, (also it uses as ID proof), Voter ID, ration card, passport. Those Documents issued by government officials which is present in your Date of birth. Address Change: There is a lot of facilities to provide your presence Address proof, those include, Voter ID, Driving License, Passport, Ration card, utility bills like Power, water, mobile phone postpaid bills, bank account statement etc. Update Aadhaar Mobile Number: No document Required For Updating Mobile Number in Aadhaar portal, you have to Verify Old phone Number through OTP One Time Password. Also, Uid portal New verification Code your Newly registered Mobile. Gender change Male /female: Mostly this mistake made by Aadhaar operator while in busy work. a lot of residents notice this after he gives the receipt to them. but there is also the extra screen for to check verify by residents. Aadhar card status, Adhar card download. Note: uid update by post useful when updating the new mobile number in case of lost. but posal update process takes several weeks rather than update online and enrollment centre. Update by Post: Mobile Number updated through post it can be done by either online or at Aadhar center Name, Adress, DOB and Email can updated thorough offline by post. This process includes downloading aadhar correction Form from uidai.gov.in. After that fil the details and send it to CIDR bangalo9re Address mentined on the Infograph. correction form send address uidai launched 6 regional offices all over india based on langues UP Luckno, Ranchi, bangalore, Hyderadbad, chandigarh, Mumbai etc. you colud find these address at aahdar centers page. Send Update Request through Post. aadhar correction form It’s Just like New enrolment form. Just fill the required details and attach the supporting documents. superscript envelop with the Updated address. the list appears tick mark on appropriate sections. Upload documents Next go the list of BPO Services available in your Area. After completion of update. Please Note Down URN (Update Request Number) To check the status of UID correction. visit UID SSUP and enter URN and Uid Number and click on get statushttps://ssup.uidai.gov.in/web/guest/check-status. You can Check Update status by URN Number. URN Number means Acronym of Update Reference Number. status codes Under review, rejected, Succesful. for checking offline, which made at center kindly visit aadhar status page. check by aadhar number or Enrollment number. Nothe w almost India 70% illiterates in rural areas. Those mostly depend on the nearest aadhaar centers for aadhar card update, but the private aadhaar enter operators charge sum amount of 100-500 INR illegally. we educated persons also encourage them to corrupt in any contract in future. Ok, leave about this corruption in uidai.gov.in. When we have to go enrollment center for adhar update. simple if online process not works or not interested in updating uid card details online due to working days. just go to the enrollment center and ask for update correct the details. aadhaar may take your photograph along with your thumb impression. What residents update at Aadhaar Kendra /center: Name, Mobile, DOB, Email, Photo, IRIS, Finger Prints. correction by post and online Uidai update portal helps almost 90% queries related to aadhaar holders of India. for information on aadhaar card update & correction status visit the eaadhar card home page. All the above discussion made about how to update aadhar either offline or online. But below we have written detailed instructions regarding possible aadhaar corrections like Name, DOB, Gender, Address, Email and Mobile Number. On the Aahdar self-service Portal SSUP Enter uid Number & OTP. Enter The OTP to proceed aadhaar correction Process. Select the required Options to make Appropriate changes Name, DOB, Address Mobile etc. After corrections made Note down the URN Number or download or else print the receipt for future reference to track aadhaar correction. Follow the mandatory steps for the update. click on Name Enter the Name and surname. Upload The Name Proofs like Pan card, passport, voter card, and driving license etc. 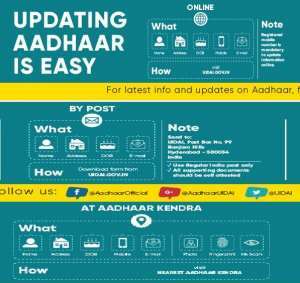 Again read the common steps for aadhar update online. Visit resident self-service portal ssup uidai gov in, Enter the Aadhar number & verify with Old mobile Number. If the Old mobile number is lost then opt for nearest enrollment center. After the OTP verification by old mobile number, Enter your New Mobile Number and then authorize the Phone Number by OTP. After that, a URN Number will be generated you can copy the URN Number to track aadhaar correction status. acknowledgment slip will display on the screen, either print or download the file it contains all correction details. we have written a detailed post about update mobile number in aadhar card. Same process but varies after step 2 visit ssup portal and then follow the above mandatory steps. Click on Email Then enter Your New Email ID or you may wish to verify email id & phone Number here. within 2 minutes or few minutes, an OTP will be sent to Email-ID kindly verify the same with SSUP. Follow the mandatory steps above click on Gender among those update options. select your gender either female or male there is also one option called transgender click on that if you do not belong to first two options. confirm the update clicking proceed .if any changes then click on modify. after this gender update process follows the post-correction steps above. After proceeding the update mandatory steps, click on DOB then Select Year and Month after that day in the ssup portal. click on proceed or modify verify with OTP. then note down the URN Number to check aadhar status. above or Not mandatory or Optional but Below details are compulsory. all the details you entered in English automatically converted in the local language. aadhaar card correction online without mobile number correction without mobile number happens by verifying biometrics of the resident. if you have iris or fingerprint scanner you could do this at desktop but CSC Portal registration is required. the simple way is to visit the enrollment center. Update Portal Aka Resident Self Service Portal SSUP URL Address is https://ssup.uidai.gov.in/update. adhaar suspended due to Biometrics integrity issue. Resident shall visit Permanent Enrolment Centre with document proofs for the update. This case Residents have to visit the nearest aadhar center along with valid id & address proof. Note: URN Number is the must for checking aadhar card update status. if you want to check aadhar status or download e aadhaar please follow guidelines on next page. enrollment no se kaise aadhar card download karun.